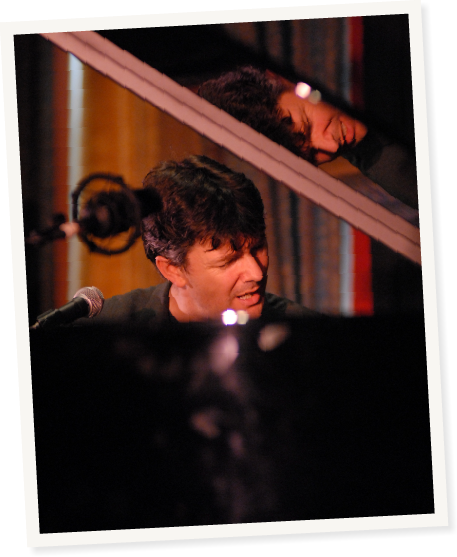 As a performer Pete has been featured at many festivals internationally working as a singer, pianist and conductor. He has been a member of both Kenny Wheeler’s and Abdullah Ibrahim’s vocal projects, travelled extensively as Mark Murphy’s accompanist and has collaborated with, amongst others, Norma Winstone, Stan Sulzmann, John Taylor, Cleveland Watkiss, Julian Arguelles, Bobby Wellins and Tina May. He has also released several critically acclaimed jazz albums under his own name. The performing and recording Pete has done over the last twenty five years reflects the eclectic career he has pursued thus far… sometimes as a singer, sometimes as a pianist either in a purely instrumental setting or as an accompanist, and sometimes multi-tasking and doing both at the same time! He also works as a conductor… choirs, orchestras, Big Bands etc. The list below reflects the breadth of his scope and his inability to concentrate on just one pathway! Pete Churchill Trio (piano, vocal, bass and drums) with Bobby Wellins (tenor sax). The London Vocal Project - Twenty-Five Voices (founder/director). Avalon Trio ‘English Music’ Improvising Ensemble (piano, saxophone, flute, clarinet and percussion). 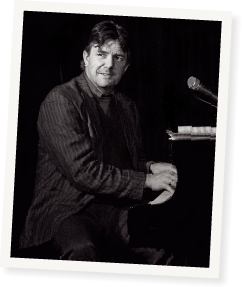 Mark Murphy Musical Director/Accompanist 1993 - 2008 – performances at festivals and in clubs throughout UK and Europe. Kenny Wheeler Conductor/Arranger, Kenny Wheeler and Jyvaskyla Studio Choir – Jyvaskyla Summer Jazz Festival. Kenny Wheeler Vocal Project Bass singer with Kenny Wheeler, Norma Winstone and John Taylor – Berlin Jazz Festival. Kenny Wheeler Big Band Conductor, Appleby Jazz Festival, 80th birthday concert and UK tour and recording. Abdullah Ibrahim Bass singer/Musical Director for ‘Abdullah Ibrahim Vocal Project’ with Abdullah Ibrahim Trio, Cleveland Watkiss and Ian Shaw – Essen, Germany and BBC Concert Orchestra – Barbican Centre, London Jazz Festival. Johnny Dankworth and Cleo Laine Director, London Vocal Project – Royal Festival Hall, London Jazz Festival. Bobby McFerrin Director, London Vocal Project – Barbican Centre, London Jazz Festival. Norma Winstone Director, London Vocal Project – Vortex Jazz Club. Stan Tracey Choir Director, Ellington’s Sacred Music At RAM. Stig Rossen & Southern Jutland Symphony Orchestra (Pineapple Records). Platinum Disk. Stig Rossen & Southern Jutland Symphony Orchestra (Pineapple Records). Gold Disk.